Chaussures Northwave Scorpius 2 Plus orange noir pointure 42 en très bon état ! Les talons en caoutchouc garantissent une adhérence optimale. très peu utilisée. Bontrager OMW cycling shoes 43 used. Condition is Pre-owned. Shipped with USPS Priority Mail. Shimano SH-M089L SPD MTB Vélo Chaussures Noir EU 45 UK 9.5 28.5 cm peu utilisé. Shimano SH-M089L SPD MTB Cycling Shoes Black EU 45 UK 9.5 28.5cm only used a handful of times but just don't get on with being clipped in. Only mark I can see if on the ratchets where I had a lay down in the middle of the road. Comes with cleats. Xt pedals are available if anyone is interested. Any questions please ask. Sidi Genius 5 Fit Carbon Road Bike Shoes Size 8 White. Excellent condition, worn twice. The right shoe has some very slight oil staining as per the photos but hardly noticeable. Rapha grimpeur Hi Viz Jaune chaussures pour le cyclisme. EU 39.5. Neuf en Boîte. Rapha Climber Hi Viz Yellow Cycling Shoes. No longer fit due to injury. Der Schuh ist kompatibel mit allen gängigen Cleats für Rennrad-Pedale (u.a. Shimano SPD-SL). die Sohle aus Carbon ist sehr steif (Grad 9) und sorgt so dafür, dass wenig Energie beim Treten verloren geht. DHB mtb shoes. Size UK 8, EUR 42. Brand new, never been used, never had cleats fitted. Dispatched with Royal Mail 2nd Class. Peloton Cycling Bike Shoes Women's Size 37 (US 6) w/Cleats. Condition is Like New. Shipped with USPS Priority Mail. The Millennium 3 sole is also more durable and less susceptible to changes in stiffness resulting from prolonged usage and changes in temperature. Millennium 3 Sole: Sidi have designed a sole that improves on the technical characteristics of the previous nylon sole. The super-strong and lightweight laces ensure an even pressure over the top of your feet and allow Gaerne to optimise airflow via the cushioned and ventilated tongue. Don't waste your hard earnt watts, instead put the power to the pedals and see your competitors disappear in your wake. The model is made by hand from a combination of carbon fiber and fiberglass. The liner and outer skin are both made of light weight microfiber materials. This shoe has a stack height of just 4.4mm. Cycling Shoes 42. Condition is Used. Dispatched with Royal Mail 2nd Class. Fiberglass heat moldable custom insoles. Giro Cycling Shoe Mens Size 11 Black With Brand New Shimano Cleats. Shoes are in good used condition. Cleats are brand new Shimano Dispatched with Royal Mail 2nd Class. The upper is now welded and bonded, resulting in fewer seams for reduced hot spots and improved comfort. It’s a great choice for riders who want a durable, comfortable shoe at a great price. Welded and bonded upper, High-quality, breathable upper, Strong and secure ratcheting N-1 buckle closure (replaceable), Offset strap D-ring at mid-foot. Shimano Road Bike Shoes Size 44 (EU 44 / US 10 / UK 9- Laced With SPD Cleats. sh-mt20m. Condition is Used, but still in usable condition. Sold as is. Pearl Izumi X ALP Launch II Boa, can ride flats with rubber spacer or with cleats on a 2 bolt pedal These shoes are fantastic... Pearl designed these to be just as good hiking with your bike as riding on your pedals. Great grip for both uses. Also, they’re designed with a boa dial on top (instead of the side) to protect it from crashes and mud. Smart. They also clean off easily. Thanks! 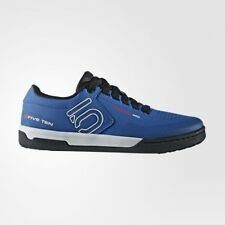 Pearl Izumi Drift 5787. MTB Mountainbike Schuhe. Die Schuhe sind kaum getragen, befinden sich in einem neuwertigen Zustand. Stabiler Mountainbike-Schuh für den ambitionierten Radfahrer in hochwertiger Verarbeitung. peloton shoes. Condition is New with box. Dispatched with Royal Mail Signed For® 2nd Class. 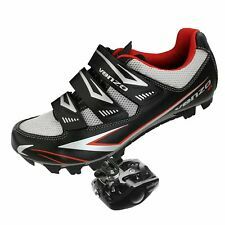 Shimano Black Cleats Spin Shoes RP1 - Size 9 43 EU - Velco Strap 3 bolts - VG. Condition is Used - V good, see pics. They have white marking 43 on back (size of shoe) No box. Cleats only. Ex instructor useage, these are no longer needed. Paid over £90. Dispatched with Royal Mail 2nd Class. Shimano Cycling Shoes 44. Condition is Used. Dispatched with Royal Mail 2nd Class. Used but in decent condition . Probably about 5 years old but I really didn’t use them much . The usual bit of wear from the pedals on the sole but apart from that they are all good Five Ten Impact Sam Hill Size 10. Condition is Used. Dispatched with Royal Mail 2nd Class. NORTHWAVE JET 365 CYCLING SHOES SIZE 47 UK 12.5. Condition is Used. Entry level mtb shoes. Good used condition. SPD fitting. No cleats. Northwave tend to size a bit small (see websites) so closer to a size 46. Mesh and synthetic upper. Insoles have some wear (see pics). Spiuk cycling shoes with carbon soles. Used condition with decent SPD-SL cleats attached. size 47. Sidi MTB ACTION SRS. Vendues cause taille. Cyclisme sur route Chaussures UK 5 Adidas très peu utilisé. Très bon état! comprend les crampons! Road Cycling Shoes UK 5 Adidas Hardly Used. VGC!. Condition is Used. Dispatched using Hermes tracked service. Including cleats! Paire de chaussures, modèle SIDI GENIUS. POINTURE : 40. Consulter nos évaluations. PLUS DE PHOTOS OU D'INFORMATIONS SUR SIMPLE DEMANDE. Le 10-mars-16 à 07:36:40 Paris, le vendeur a ajouté les informations suivantes . Sidi Cinq Mega Taille 48. Carbone Composite Semelle wide fit. Lightly used before being put in storage. No original boxes. Paire de chaussures, modèle SIDI TECNO. POINTURE : 39. Consulter nos évaluations. PLUS DE PHOTOS OU D'INFORMATIONS SUR SIMPLE DEMANDE. Consulter nos évaluations. PLUS DE PHOTOS OU D'INFORMATIONS SUR SIMPLE DEMANDE. ADIDAS ADIPURE 2 SG. Modèle de 2009 Porté par ROBIN VAN PERSIE et KAKA.